A classic piece of furniture for any den or game room, the Backed Bar Stool - Cappuccino by R.A.M. Game Room Products features a dark finish with a vintage look. While not excessive or extravagant, this bar stool carries traditional charm, with an appearance inspired by antique furniture. R.A.M. Game Room Products focuses on creating superior designs paired with reliable materials, and this model is no different. Match a pair of these bar stools with one of the Cappuccino tables listed in the features below, or bring home four or five of these bar stools to complement an existing bar! Depending on the number of stools ordered, these items ship either via a full-size semi-truck or via UPS / FedEx. 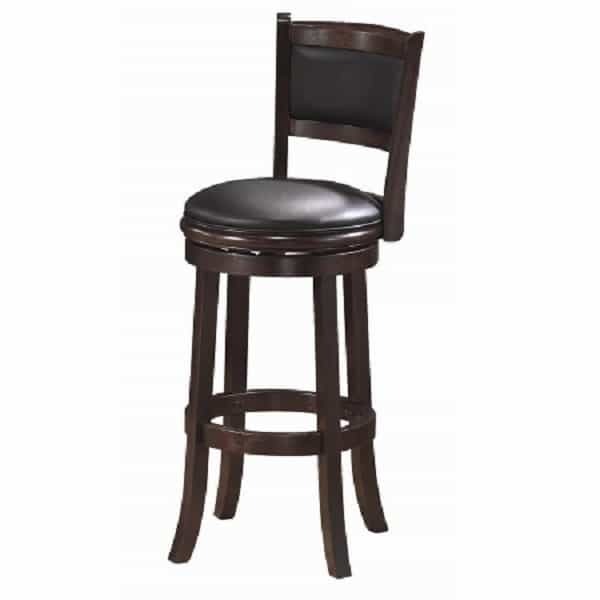 Most delivery times within the Continental U.S for in stock bar stools range from 2-5 business days depending on location. All in stock bar stool orders received before noon will ship that SAME DAY.